Rotor Ron on the podium at OCRC! 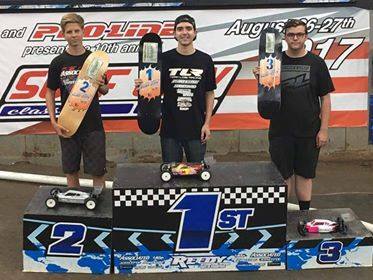 Last month Kyle Robb bought a couple motors for the 10th Annual Pro-Line SurfCity Classic at OCRC Raceway. Little did I know what was about to happen. In 17.5 buggy Kyle qualified 16th of 87 entries. Starting 6th in the B-main he was able to take a bump spot to the A-main. Starting dead last in 12th, at the tone of the 10 minute Amain he put on a clinic while driving all the way to 3rd place. That is just plain awesome! In 13.5 4wd buggy, Kyle was able to qualify 7th of 55 entries and was able to run 8th in the Amain. I am so proud to be represented so well in such a big race like the Surf City is. Please join me in congratulating Kyle on an awesome weekend of racing! Get yourself a Rotor Ron tuned motor and put yourself on the podium too!